Gotz Hannah dolls were the first type of Gotz doll that I discovered while exploring which makes of doll to stock at Bambolina, as Petalina started out. But I think I had come across Gotz a few years earlier. 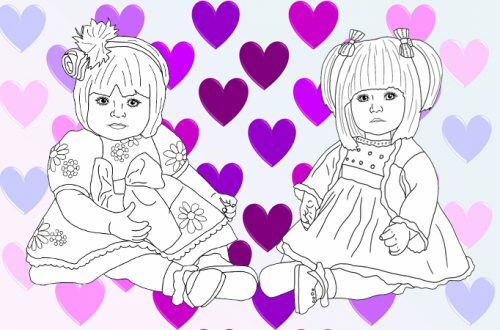 It was while I was searching for a Sasha doll for my eldest daughter Libby because I had had Sasha dolls when young and loved them, and my hunt had taken me to Guildford. Daisy and Tom had just opened and I wanted to check out their toy range and whether they had any dolls. Needless to say the toy department was superb and I thoroughly enjoyed having a good look around. They didn’t have any Götz dolls but I was pleased to discover that they had a really good range of Corolle dolls, many of which I hadn’t seen before either. A couple of purchases later and I left Daisy and Tom only to stumble across a Teddy and Doll shop down a cobbled side street nearby. It was a tiny little shop and downstairs was filled with bears of all shapes and sizes, so I made my way up the narrow stairs to the first floor and there in front of me were a few brand new Sasha dolls for sale. I couldn’t believe it! I remember there was one with long dark hair dressed as a squaw but with a price tag of around £200 I felt she was too expensive to buy for my daughter to play with. With hind sight Libby would probably have loved her as she has never been keen on traditionally pretty things as most little girls are (dolls included, but I didn’t know that then). Such a Sasha would have remained in good condition on a shelf in Libby’s room not played with! It was in this shop while discussing the alternatives to the expensive Sasha that the shop owner pointed out some Götz babies. They were about the size of my baby Sashas and I remember they were exquisitely dressed. I can remember appreciating their quality, but at the time they weren’t what I was looking for so I didn’t purchase anything. However, when I made the decision to start an internet store, Götz was in the forefront of my mind so I continued my search to find some more of their dolls. It makes me very sad that this gorgeous little teddy and doll shop closed down some time ago, probably due to the opening of Daisy and Tom, The Entertainer and Early Learning, all on it’s doorstep, and the decline of interest in doll collecting. And since writing this Daisy and Tom has gone too which is very sad. Gotz Sarah at the Ballet, one of the original Sarah dolls and still available now (as Hannah). At the time the shoes were made of leather (now plastic), the cardigan is now plain jersey and the hair band has been replaced with a fancy hair accessory. My hunt for Götz dolls continued and while living in Richmond a few years before I remembered visiting the fabulous toy shop Tridias and seeing some beautiful ballerina dolls in there. I imagined that the London branch of Tridias might have an even better selection so one day I set off to find both Tridias and to visit Harrods. To my dismay Tridias had closed down! However, once I arrived in the doll room in Harrods I was in heaven. There were so many Götz dolls including the whole range of Sarah dolls (now Hannah), Just Like Me dolls (which at the time were exclusive to Harrods), boxes of Götz dolls clothes, many of the Muffin dolls and Aquinis, as well as some beautiful hand crafted limited edition dolls exclusive to Harrods. I decided to purchase one of the gorgeous Sarah dolls, Sarah at the Ballet with blonde hair, and one of the exclusive dolls with long dark hair wearing a pale pink velvet dress covered in ribbons which had been designed by David Charles to match a little girls dress. At the time I was bowled over by just how beautiful both dolls were and the quality was unquestionable. Without doubt they were the most beautiful dolls I had seen since owning my Sashas. The dolls shared the same moulds for their bodies and limbs but had different face moulds. Sarah had been introduced to the Gotz range in 2004 and her beautiful face was designed by Hildegard Gunzel, who over the years has sculpted many doll faces for the Gotz range. I’m not sure of the doll artist responsible for the gorgeous Harrods exclusive doll, but she has a face mould used by Gotz for some of their other play doll ranges. (As of 2018 we know the artist is Sissel Skille and her faces have been used by Gotz for Happy Kidz dolls more frequently over the last 2-3 years). This doll had a much higher price tag and her clothes and shoes were simply divine! Even her vinyl was rose scented. A few years later Rosie claimed the gorgeous Harrods doll as her own. When clearing out her room recently we found the dress, underwear and socks, but the beautiful shoes had disintegrated so we threw them away (very sad). In 2006, when I purchased my first Sarah, there were several dolls in the range called Sarah’s World. Each doll was dressed for a different interest and came with relevant accessories and a spare set of clothes. There was Sarah at the Ballet with blonde hair and blue eyes, Sarah with her Dog with red hair, Sarah going to a Party with blonde hair and Sarah at the Spa with brunette hair. Over the years the hair and eye combinations have varied a little, and in 2010 Sarah’s name was changed to Hannah. 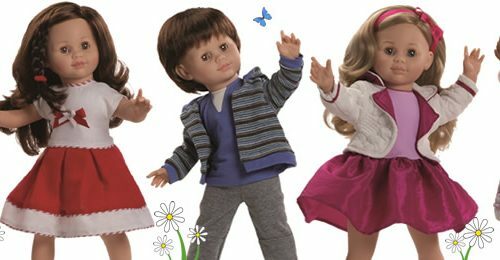 There was no explanation for the change of name because essentially the dolls were the same, but we think it was due to a trademark issue. Gotz Hannah dolls have continued to grow in popularity with more dolls being added to the range including Hannah loves Riding, Hannah as a Rockstar, Hannah at the Ballet Black and Asian, and Hannah as a Princess. Baby Hannahs in both 33cm and 42cm sizes were also added for a few years and each of these comes with accessories and spare clothing, just like the Hannah dolls. 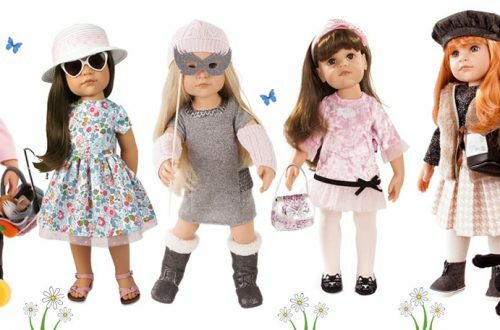 The range of dolls clothes and accessories continues to grow every year too, so there is always something new and appealing for Hannah fans to dream about and to add to their birthday wish lists or Christmas lists. Recently, I had cause to remove Hannah as a Princess from her box for a customer. It had been a while since I had seen a Hannah close up and to be honest I had forgotten just how beautiful a doll she is. Gotz Hannah dolls have been really popular at Petalina since the beginning and we therefore have lots of stock sitting in boxes on Petalina’s shelves at all times. As a result I seem to have started taking Hannah for granted, being bowled over by all the new multi-jointed dolls constantly appearing in the marketplace. So what is it about Hannah that has made her so popular for so long? What is it about this doll that is so appealing? Gotz Hannah dolls are 50cm dolls made from high quality vinyl which is phthalate free. Their hair is always long, silky and layered and dolls that come with plaited hair tend to have particularly long hair when loose. Some have a fringe and some don’t, plus partings vary too. Gotz choose to give their play dolls rooted hair which they believe is stronger and more resilient than wigged hair. Hannah’s face is incredibly pretty, which little girls find very appealing. Her acrylic glass eyes are sparkling and so realistic and these are inset (non closing) with natural looking long eyelashes. There is also some hand painting around the eyes to give them a more realistic appearance. She has delicately painted eye brows, softly blushing full cheeks and finely detailed lips. She’s a very beautiful doll originally designed by Hildegard Gunzel, a world renowned German doll artist. You can see that a great deal of time and effort had gone into sculpting Hannah’s limbs as they have such a natural and graceful appearance. Her hands and feet are both very realistically modelled and one knee is slightly bent which gives Hannah a softened, relaxed look and makes her easier to stand on her own. Gotz Hannah dolls joints are also fully articulated so the dolls can be posed in lots of different positions. When my mother first saw Hannah she was impressed with her overall sculpting and particularly the modelling of Hannah’s hands and feet. She has always been interested in Petalina’s dolls due to her father sculpting dolls for Rosebud dolls when she was a child. Hannah really is a very beautiful doll indeed. So what age girl will enjoy playing with a Gotz Hannah doll? There is no doubt that even 3 or 4 year olds will love her face but her all vinyl limbs make her harder to dress than soft bodied dolls. Girls of this age tend to have a preference for a cuddly doll too with eyes that close so she can go to sleep. I usually recommend Gotz Hannah dolls for girls from the age of 5 and up. Hannah can then grow up with her new little mum, going on lots of adventures and enjoying being dressed up in interesting and fashionable outfits. I regularly hear stories of girls of 11 still loving their Hannahs! When my eldest daughter was 8 there was a craze for a while at school where lots of her friends took in their Hannah dolls to play with at break time. If you do decide to invest in a Gotz Hannah doll as a gift for a little girl in your life, you will certainly be impressed with the quality of the doll and her clothing. Gotz dolls used to be made in Germany but in the early 2000s production was moved to China. Occasionally, there may be a small quality problems but Gotz will always help retailers to sort things out. It may take a little time, but it will always happen in the end.